I am trying to make the case for why social media should be used within an organizational setting.In my last post I considered aspects of defining benefits as as way to tell an effective story. Now I want to take a stab at a different approach. This time I am going to be a little more graphical a là Kathy Sierra. Update: the graphics did not show up as well as I hoped. I guess I am not providing a great user experience. 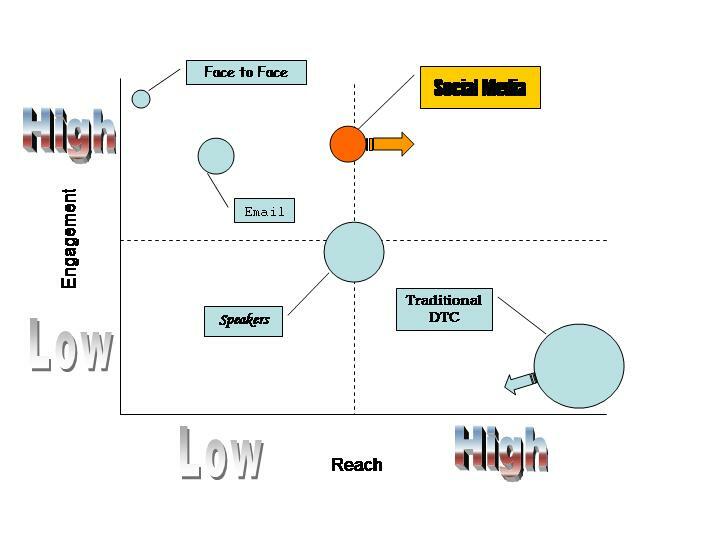 Translation: Upper Left – Face to Face, moving down and to the right, email, speakers, and finally Traditional DTC in the lower right corner. Social media in Orange. One of Kathy Sierra’s main themes is about getting to the root of what it is that "users" want. This is more commonly referred to as benefits to the user. Most people/organizations that have a product or service to sell, have a tendency to define the benefit with respect to the product or service it self. Kathy’s point is that users don’t really care about the product or service itself, they care about what the product or service can enable them to do. The typical response is "but show me the benefit." As I read Kathy’s post this morning, I began to wonder if I have fallen into the trap of defining the benefit in terms of the subject (social media) instead of the object (the user). So it is off to find a new windmill, how to show the benefit of social media in terms that clearly point to the benefit of the user, as opposed to meeting my own need of finding a problem for my solution. On Monday I attended Healthcare Blogging Summit in Washington DC. This was a sub-conference of the Consumer Health World conference. The keynote speaker was Steve Rubel from Edelman. Steve gave a great presentation defining "Social Media". I took some notes and picked up some new ideas. One of the main points I picked up was his metaphor for social media as a "universe" that is populated by "galaxies" (centers of gravity such as mySpace, YouTube), "stars" (the A-List Celebrities), "planets" (the B&C list), "shooting stars" (flash-in-the-pan: Diet Coke and Mentos), and "comets" (recurring themes: authencity, transparency). It is a good image and I will probably use it. The first three were to me straightforward and part of the story I try to tell others. The last point, Empowerment, was a light bulb. I had never carried the thought process to the next logical step. Empowerment is really the fundamental element of social media. To be honest, the light bulb did not really turn on until today (sometimes I process rather slowly). Social Media is anything that empowers the rest of us. Up until now, whenever I have been asked "What is social media? ", I would usually list a string of technology terms. "It’s blogs & wikis & RSS & social networks & …" Not a very satisfying or compelling answer. Now I have something to say. Steve, thanks for the spark. I think that sometimes it takes listening to the words for a long time before you really hear the meaning.